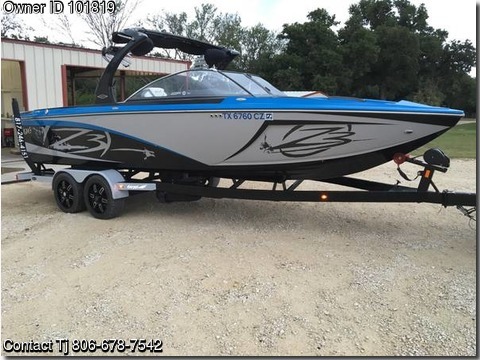 Boat is located in Grandview,Texas..Please contact the owner @ 806-678-seven five four two... 2014 Tige Z3 Pro Surf Addition 109 hours. 23' with Z tower, Wetsound stereo system, 2 Wetsound 10" tower speakers with blue light rings, lighted tower, Taps system, neoprene speaker covers, surf Bimini top, Tige Touch with up to 6 riders saved, 2,400 lbs ballast, in boat cooler, trash can, Tige floor mat, battery charger, Raptor 400 motor with 22 months of warranty left, lifetime hull warranty, low pro trailer with custom wheels and runway led lights, Bluetooth stereo, boat cover with swim deck cover, swivel board racks, captains chair. Basically has every option available in 2014. Boat has been cleaned and stored inside after every outing. Fantastic boat to surf or wakeboard on. Eagle Marine has serviced the boat every 25 hours since new. There is nothing wrong with this boat and has no blemishes. Never tied to a dock, never been beached and has never been in salt water. Please call or text for info. I will not respond to emails.